German democracy activist Claudia Dantschke is the recipient of the 2017 Stieg Larsson Prize, for her decades-long work with deradicalization of young people in Islamist environments, and her promotion of more nuanced views on Islam and muslims. 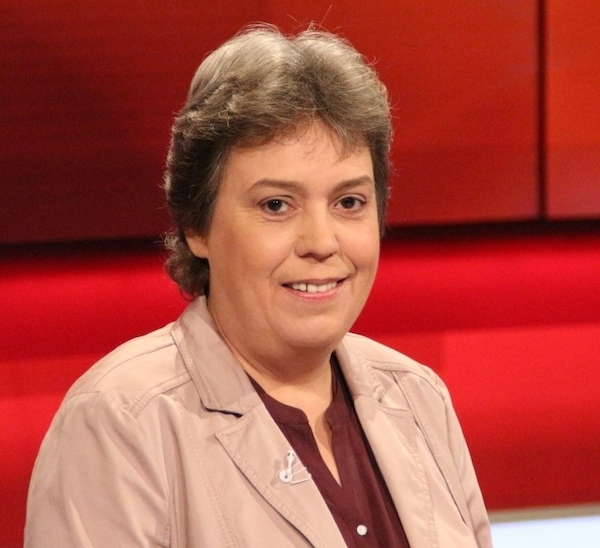 Claudia Dantshcke is one of Germany’s leading experts on Islamism and Salafism. With a degree in translation and interpretaion from Arabic and French, she worked as a journalist and editor at the East German news agency’s Middle East bureau, and subsequently as a freelance journalist after German reunification, mainly for the German-Turkish independent broadcaster AYPA-TV. Since 2001 she is a fellow at the Zentrum Demokratische Kultur (ZDK), an organization that advances enlightenment ideas and democratic values. On behalf of ZDK, she has analyzed Islamist and far-right networks in different Berlin districts, with the purpose of developing local strategies for facing and preventing antidemocratic forces. In 2011 she initiated Hayat, Germany’s first consultation center for deradicalization, which offers advice and support to people in Salafist and jihadist environments, as well as to defectors and kin. Dantschke started researching and challenging antidemocratic forces within political Islam long before our current preoccupation with the issue: already in 2000 she co-authored a treatise on political islam in Europe. In contrast to alarmist or virtue-signaling punditry, her work is characterized by qualified knowledge, rationality and pragmatism – and always solution oriented. A consistent shunning of stereotypes and prejudices, as well as a nuanced and compassionate view of radicalized youths, has awarded Dantschke enemies among far right and Salafist groups alike. By way of books, articles, lectures and training, she disseminates the knowledge she has collected and the strategies she has developed during many years of applied field work. The 2017 Stieg Larsson Prize will be presented to the recipient on Wednesday 8th November at 6 pm at Norstedts Publishing, Tryckerigatan 4 in Stockholm. Steig Larsson, author of the Millennium trilogy, waged a constant struggle against racism and misogyny, and for freedom of expression. The struggle was motivated by a simple idea: that each human being should have the right to be themselves. In memory of Stieg Larsson, Norstedts Publishing along with Stieg Larsson’s father Erland and brother Joakim, has founded a prize of 200 000 SEK. The prize is awarded to persons or organizations that continue Stieg Larsson’s struggle. Once a year, an independent jury selects a recipient. This year’s jury consists of publisher Elnaz Baghlanian, Expo Magazine’s editor-in-chief Daniel Poohl, journalist Mathias Ståhle, human rights attorney Johanna Westeson, and publisher Svante Weyler.